It’s not going out on a limb to say that Kris Bryant is likely the most attractive person who has ever been a Chicago Cub. The 2016 World Series champion third-baseman inspires crushes across the board, so swayed are we all by his impossibly aquamarine eyes, understated-yet-swarthy stubble, and graceful reaches and strides throughout the infield, like some sort of wondrous baseball unicorn. Over the past few years, he’s also proven to have a sense of humor through his involvement in pranks as part of his gig as a Red Bull spokesman. Two years ago, he stood in as a walk-on for a Mesa baseball team; then last year, Bryant himself was pranked by Hall Of Fame pitcher Greg Maddux, disguised as a sound guy who then started throwing Bryant pitches. 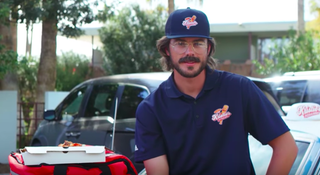 This year, Chicago’s WGN and other outlets report that Bryant covered up his messiah-esque good looks to don a wig and a mustache to transform into Kristio, a guy delivering pizza to a bunch of hotel rooms filled with friends hammering out their fantasy baseball leagues. The first person to ID Bryant will receive a special Red Bull Kris Bryant can. And will get to meet their idol, of course. Bryant is a little into himself on the trip over (really, who could blame him? ), stressing that he should definitely be in the top round of picks. It is pretty funny as the Cub nonchalantly wheels in the pizza though, right behind one guy who loves him so much, he recently named his son Bryant. Kris Bryant then listens in on what the drafters are saying about him, commending one guy for picking “Kris Bryant,” saying “that guy’s good,” and also accurately pointing out, “you guys have no clue.” When the disguised Bryant tries to blame his home-run tally on the wind blowing in at Wrigley Field, a few guys catch on, delightfully giggling and elbowing each other until the rest of the fantasy league crowd goes wild. We don’t know how the Cubs will do this year (despite 2016, we try to keep our expectations low), but that dad will sure have a story to tell baby Bryant every year on opening day.